The Florida Gators began the 2013 season pretty well, only losing to a very good Miami team on their way to a 4-1 start before the wheels fell off the wagon and the Gators lost 7 straight games including three in The Swamp, a feat that hadn’t happened since 2010 and for those of you keeping score, there was a coaching change after that season. Needless to say, regardless of what head coach Will Muschamp says, there is a very hot seat in his office in Gainesville. 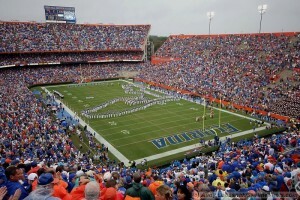 The Gators have to win big this year or there will be change at the top. Grant it, Florida did suffer a massive amount of injuries in 2013 but the silver lining of a lot of injuries is the following year your team will be very deep, experience wise. Also, hiring a new offensive coordinator who will bring more spread concepts to the offense will be a big help as many of the players on that side of the ball were brought in to play that type of ball, including junior quarterback Jeff Driskel. Defensively, despite all of the injuries the Gator defense still only gave up 21 points per game in 2013 and return defensive stars like sophomore cornerback Vernon Hargreaves III and junior defensive end Dante Fowler. The 2014 schedule for Florida is no cakewalk but can be broken up into thirds. The first third is fairly simple with two easy non-conference opponents at home (Idaho & Eastern Michigan) followed by Kentucky at home and a road date with Alabama. The second third comes after a bye week with an upstart Tennessee team in Knoxville followed by the annual date with LSU in Gainesville. Then to close out the month of October for Florida, the 2013 SEC Eastern division champion Missouri Tigers come to town. The final third of the season is by far the most difficult as it opens with Georgia in Jacksonville followed by a road game at Vanderbilt, South Carolina in Gainesville and it ends with the reigning National Champion Florida State Seminoles in Tallahassee. The Gators were bit badly by the injury bug in 2013 and if Florida has at least a little bit better luck than last season, they will be much better. Plus, Head Coach Will Muschamp is coaching for his job which could also be a curse. Ditching the pro-style offense for the spread shows that Muschamp has gotten desperate to keep his job in Gainesville. All in all, the offense will be better and the defense will be just as good which will translate into at least four more wins in 2014. Stay logged on to Sowegalive.com for Team #18 on Wednesday and tune in to the Southern Football Report every Saturday from 10am-Noon starting on August 23rd! Here is a hint for Team #18: This team’s stadium can not be taller than the pine trees that surround it.